The new Band Aid single has received its world premiere on BBC Radio 1. Do They Know It's Christmas? by Band Aid 20, was broadcast at 0800 GMT during the Chris Moyles Breakfast show on Tuesday. The song, featuring artists including Bono, Coldplay's Chris Martin and Dido, is a remake of the 1984 original. The new version features a reworked chorus, rapping from Dizzee Rascal, guitar riffs from The Darkness, and Martin on the piano. The single will raise money for food aid in Darfur, Sudan, when it is commercially released on 29 November. 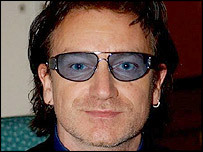 Bono was persuaded by Bob Geldof to perform the powerful line "Well, tonight thank God it's them instead of you" after singing it on the 1984 original. The U2 frontman returned from Ireland to record the new rendition and said he took a different approach to his first "raw" contribution. His version was used instead of one recorded by Justin Hawkins from The Darkness. Will Young, who duetted with R&B star Jamelia on the single, told the Chris Moyles Breakfast Show recording the song had been an "emotional" experience. He said: "We all got into the studio and it was slightly overwhelming to see everyone in there together. "But then Bob Geldof showed us a video of what it was like 20 years ago for children and their parents in Africa. "Everyone was in tears but it focussed us on why we were there. Suddenly we realised there was a point to it all." The video, which premieres on BBC One this Thursday, features stars including Joss Stone, Jamelia, and Busted, who also took part in the recording sessions at the weekend. The single will be titled Band Aid 20 to mark the 20th anniversary of the original song, which involved stars such as George Michael, Duran Duran and Phil Collins. It was organised by Geldof after he saw news footage of the starving in Ethiopia, and sold more than 3.5 million copies in the UK alone. The funds from Band Aid 20 will mainly go to fighting famine in Africa, particularly in the war-ravaged Sudanese region of Darfur. But the World Development Movement - which campaigns for international development - said many of the song lyrics were "patronising, false and out of date". The organisation condemned the "negative stereotypes" depicted in the song and regretted it did not "provide a more accurate reflection of Africa and its problems". Director of WDM, Mark Curtis, said: "The song perpetuates the myth that Africa's problems can somehow be blamed on lack of rainfall and failed harvests. "It conjures up an image of a continent inhabited entirely by starving children with flies on their faces sitting in the sunbaked bed of a dried up stream." But the organisation added that it did not want to discourage people from buying the record. Sold on CD for £3.99 and also available as a download, the new version is hot favourite to be Christmas number one in the UK this year. Retailers expect to sell about 500,000 copies in its first week on sale. Woolworths and Virgin Megastores will give their proceeds to the Band Aid Trust charity.